More background info: Bradford, believe it or not, used to be one of Great Britain's richest cities, thanks to the once booming textile industry of the region. That's almost all long since gone and the economic decline of the whole region hit Bradford particularly hard. In addition some of the architectural crimes of the 1960s in particular disfigured much of the cityscape beyond recognition – rivalled perhaps only by Sheffield (what illness was it that beset 1960s architects in Britain and elsewhere? – I've never been able to find out …). 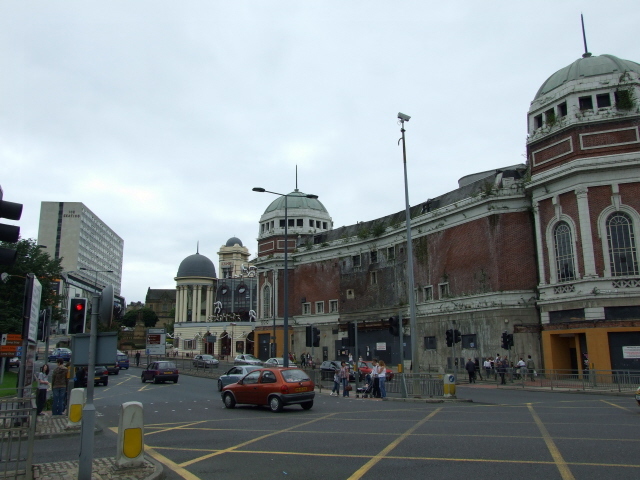 But more than sheer ugliness in terms of looks, Bradford is especially known for being a place of a clash of cultures – it has one of the largest Asian, in this case predominantly Pakistani, communities in Britain (about 25% of the population). And on occasions there have been clashes in the quite literal sense. The "race riots" of 1995 and 2001 made nasty headlines for Bradford in the national press. What is less known is that these were in part driven by "imported" troublemakers on both fronts, right-wing nationalists and Asians alike (e.g. from Oldham near Manchester). Still, esp. the 2001 riots were violent and resulted in more riot-related arrests and sentences than any other in British legal history. Some of the scars of the riots can still be seen today. Bradford's not exactly a pretty place by any standards but it has its cool bits. Also credit where credit is due: some of the very worst of those 1960s architectural crimes have meanwhile been demolished (three cheers – and a kick in the architect's groin) and reconstruction of the city centre is ongoing. This is in some cases not necessarily a massive improvement over previous states of outward appearance – and my former workplace, the University of Bradford, is a good case in point. But the city is working hard on improving its image. One aspect that absolutely no image boosting campaign is necessary for is Bradford's curry houses. Their reputation is well earned. You can have some the world's best curries here. (But don't be fooled by those who tell you that the city's oldest and best curry house is a certain place right opposite the university named after the region most Pakistani immigrants in Bradford are from. It is neither the oldest nor the best – the latter it is not by quite some margin. Ignore what Wikitravel or Rough Guides say – as regards curry they clearly have no clue. Take it from me, I lived in Bradford for five years and have been to more curry houses than I can count, and have had better curries almost everywhere else). The place I always go back for (my wife and I are known to have even made the journey specifically for it more than once) is the Aagrah in Shipley. The quality of their food and esp. the consistency at that level of quality is stunning. I've never had a meal there that wasn't outstanding in the 12 years or so I have been returning to the Aagrah. But there are also loads of good quality cheap curry joints in Bradford itself. But back to dark tourism. Bradford may not be an essential place on the grander dark tourism map of the world, but may be worth a detour and stopover when in the region. 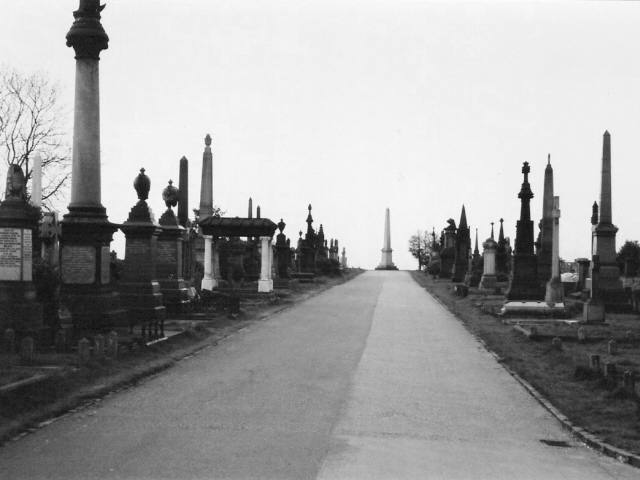 What there is to see: Not an awful lot, unless you count Bradford's general grimness, but one particular place that stands out is the Undercliffe cemetery. It's on top of one of Bradford's hills (it should be called Uppercliff, really) and well worth popping by for a stroll. It is a fine example of a typically Victorian cemetery (see also Highgate and Glasgow Necropolis) with some lavish graves of the then rich and famous – well, rich more so than famous; the cemetery received its grandest mausoleums during Bradford's wool industry heyday. 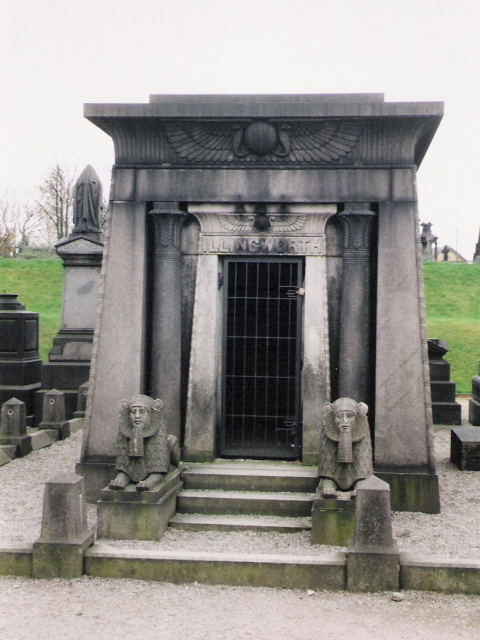 Look out for the Egyptian design mausoleum – complete with stone sphinxes guarding the gate to the tomb! On a more contemporary dark level, you could drive through the part of town that was the main setting for the Bradford race riots of 2001. Driving north-west from the city on Westgate and Whetley Hill you'll come to an intersection, with Whetley Lane to the left and Carlisle Road to the right. Here, some of the most violent clashes occurred, cars were overturned and torched – for a long time you could still see the charred square patches on the tarmac (but no longer). The Upper Globe pub to the right of the lower end of Toller Lane was attacked in the riots and has been closed and boarded-up ever since. In the field opposite stood Manningham Labour Club, which was firebombed and burned down in the riots ... the Club moved to a different location afterwards and the original site has meanwhile been redeveloped. If you turn right behind the Upper Globe pub and drive up Heaton Road you'll pass a wonderful old ruin on the right that looks almost like a fairytale witch's house – unfortunately it's really derelict and may not remain standing for much longer. Further up Heaton Road you'll see the imposing structure of the former Lister's Mill (or Manningham Mills) factory building with its magnificent tall Italianate campanile chimney. For many years this was Bradford's most glorious ruin, laying empty and derelict. I often popped by to savour its strange atmosphere for a bit while I lived in Bradford ... it was almost en route to work, so only a slight detour. Today, however, the atmosphere's changed. The building has been converted into luxury flats. What impact that may have on the race and class tensions of this volatile area, Manningham, remains to be seen. But at least the building's facade itself remains a brilliant sight, a fortress of industrialization ... apparently it was the largest silk factory in the world. Location: just under 10 miles west of Leeds in West Yorkshire, northern England, Great Britain. Access and costs: easy and mostly free. Details: Bradford is linked by train to its larger and richer neighbour Leeds, the two cities share an airport, and Bradford's own bus terminal at the Interchange is served by National Express and regional buses. It's easiest to get to by car, though. From the south the short stretch of M606 motorway off the main M62 leads to the city and its ring road. From the north the A650, A658, and A65 provide access. Accommodation options in Bradford may be scarcer than in many other cities but you do get the usual range from B&Bs to business hotels. If you don't want an overnight stay in the fairly grim city centre itself (you'd be forgiven) you could think about staying in Shipley/Saltaire just north of the city. Time required: Most Britons would probably say, a single minute is more than they'd ever want to spend here, but to be fair, a day's stopover does probably suffice, maybe another for Saltaire (see non-dark combinations). Combinations with other dark destinations: see Great Britain. Combinations with non-dark destinations: As I was trying to convey, Bradford itself isn't as bad as its reputation, though admittedly, real tourism sights within the city itself are rather scant. The neo-Gothic City Hall and the old merchant's quarter of Little Germany may be noteworthy. 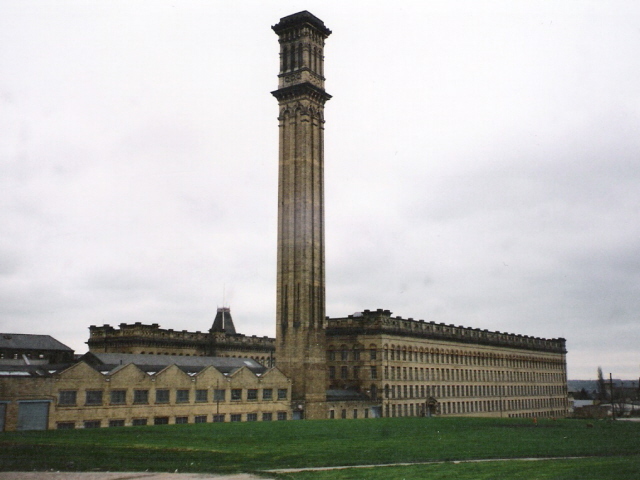 The prime sight, however, is just outside Bradford itself in the northern suburb of Shipley, namely Saltaire. It's one of the best preserved planned workers' villages, namely for the adjacent Salt's Mill, a former textile mill, whose eponymous philanthropist owner Sir Titus Salt built a village fully equipped with everything from church to nurseries (but no pub!) for his workforce, at a time when elsewhere ruthless Manchester capitalism had the working classes live in squalor. Today, the Mill is closed (like almost everywhere in the impoverished region) but has been turned into a major tourist attraction through the dedication of yet another philanthropist millionaire who bought the Mill building and turned parts of it into an art gallery. In it works by Bradford's most famous artist David Hockney are on display. There are also some classy shops and cool cafes. All inside this grand Victorian industrial building with its endless floor space. Very cool. The village of Saltaire has long become fashionable rather than working class and its architectural consistency is a sight in itself. Beyond, to the north-west, the Yorkshire Dales National Park provides some of Britain's most wonderful scenery. And Fountains Abbey near Ripon is the most wonderful and largest semi-ruin of all the ruined monasteries/cathedrals in Great Britain.